Collagen MSM Plus is a collagen drink produced in Germany. High production standards are pretty much a golden rule around these parts, so we are excited to bring you another quality review to expand our collection! Collagen MSM Plus is available from the official site for £49.99 a bottle what covers you for 20 days, but we found it cheaper from Amazon, currently, it’s £44.99 for 20 days worth of supplies, which comes to £2.25 a day. Not too shabby! Compared to other products out there, this one seems to be in the affordable range of the scale. Sadly, there is no money-back guarantee whatsoever, which surely leaves a dent in the final grade. The top-rated products all have one in one form or another, so it’s absolutely essential to take these standards into account. However, you may still encounter a merchant who’s willing to provide you one. How Effective is Collagen MSM Plus? 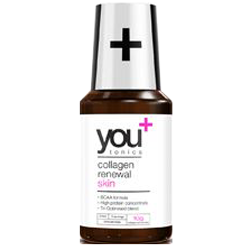 This product contains 8000 mg of collagen, which is fantastic! It neatly falls into the ideal range between 7000 mg and 10000 mg of collagen. Anything below means that the product is not potent enough, and anything above is considered to be overkill since the human body isn’t able to absorb such an amount anyway. Sadly, it contains bovine collagen instead of marine collagen, which is not ideal, so we have to deduct a couple of points in this section. In short, the participants were taking the collagen drink on a daily basis for 6 months. The quality of their skin was dermatologically evaluated at 0, 3, and 6 months and compared to the control group. After 3 months of taking collagen supplements, the participants showed a significant improvement in terms of their skin health, and after 6 months, the results were even more visible. Furthermore, the pain related to damaged joints seemed to be quite a bit lower according to the participants’ words. 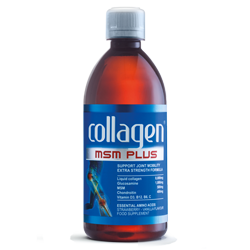 Collagen MSM Plus is very convenient to use since it’s a ready-made drink and not a powder. These types of collagen supplements are typically very fast and easy to prepare and consume on a daily basis, so we have no complaints. It tastes like fruit juice with a hint towards vanilla and strawberry, so we haven’t really found the taste particularly bothersome. However, if you’re sensitive to tastes in general, there’s nothing wrong with mixing it with a beverage of your choice. Because Collagen MS Plus comes in a single glass bottle, we are happy to award it a good grade in this category. This is because a single glass bottle doesn’t really make a noticeable impact on the environment, and this is the type of Eco-friendliness that we like to see. This seems like a great quality product, and we can fully recommend it ourselves. Lack of a money-back guarantee seems to be the only remark, but that is the only downside. If you do prefer a product with a full money-back guarantee then check out the #1 collagen drink YouTonics, if not, then go and get it from Amazon here and let us know how you got on! Can you please evaluate Taut liquid as well?